At the center of every massive galaxy lies a supermassive black hole. In a small percentage of galaxies, so called Active Galactic Nuclei or AGN, these black holes are currently accreting gas and dust and shinning luminously as that material looses energy. It is thought that some galaxies have this AGN activity at their center and others do not because of the presence or absence of gas near-enough to the black hole to be accreted. But many questions remain, including how the gas which can live any where in the galaxy, gets down to the very central regions. These bar features are easy to form in a big disk galaxy and are likely transitory, first coming together and then dissipating. Most importantly, models suggest that these bars can drive gas inward towards the central regions of galaxies. Whether or not these galactic-scale structures, which can transport gas towards the central regions of a galaxy, could be related to episode of AGN activity has been debated for decades. One of the simplest ways to approach this issue is to observer whether or not a bar feature in a galaxy is observed to correlate with the presence of accretion at the very center of the galaxy. In other words, if galaxies containing bars are more likely to host AGN, than we can hypothesize that the bar may be responsible for feeding gas to that AGN. Because the scale of the central supermassive black hole is many orders of magnitude smaller than the regions into which the bar can transport gas, the connection is not as straightforward as the simple story seems to suggestion. Before Galaxy Zoo, investigations looking into the connection between the presence of an AGN and that of a bar in galaxies suffered from being too small or looking at galaxies with only one particular color. Now With Galaxy Zoo we can search 10,000 galaxies and look at each for the presence of a bar, and use the spectroscopic data from SDSS to identify any AGN activity. 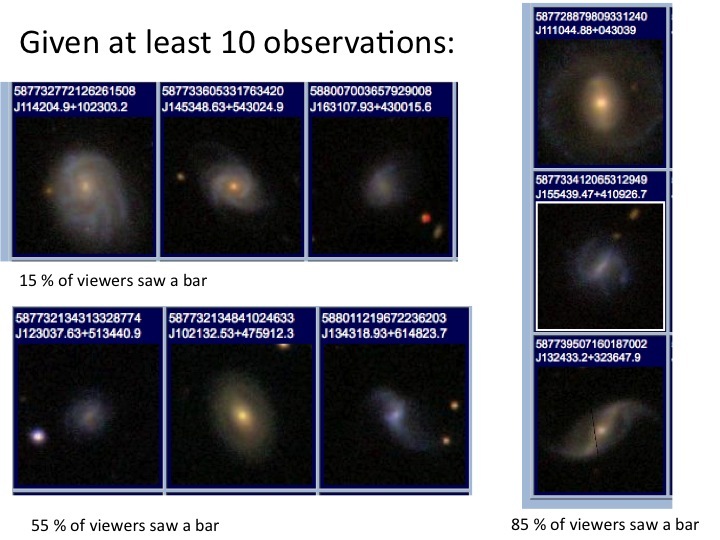 We look at the votes from the viewers in galaxy zoo and assign a probability that a bar exists in a single galaxy by comparing the number of people who indicated a presence of a bar to the total number of people who viewed the galaxy. As the image below shows, we can accurately identify barred galaxies by selecting those where at least 50% of the classifiers identified a bar in the galaxy. We found that both the presence of an AGN and the presence of a bar are tightly correlated with the color of a galaxy and its size. This explains why so many previous samples might have found contradictory results, depending on which types of galaxies in their sample contained AGN activity and which contained bars. However, because the sample of galaxies in Galaxy Zoo is so large, we can look at samples of galaxies with similar sizes and colors. And when we control for the effects of size and color, there is no longer a large correlation between the presence of a bar and central AGN activity. This means that although the bar is responsible for driving gas inward in the galaxy, it doesn’t get it close-enough to the center to incite black hole accretion (or AGN activity). This result can have far reaching implications for models of galaxy evolution, which need to explain how galaxies (and their central black holes) grow. Unfortunately it rules out one popular idea: bars are not a key source of inciting black hole growth in galaxies. Interesting. But it would be nice to see a bigger version of the classification picture. Would it not also be a valid argument to say that galaxies become active for many (many!) years after a galaxy interaction event. The torques would provide a rush of gas towards the centre of gravity of the two merging galaxies providing enough fuel for the sort of energies emitted by quasars, AGNs. etc? But it’s very interesting to see another method that could drive gas towards to the centre of such galaxies. I’m going to be following this quite closely. Excellent stuff!